St Flannan's Catholic Parish has a small piety stall located near the church entrance. The Piety Stall is open before and after each Sunday Mass. 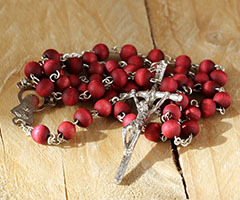 A small range of religious items are sold, including rosary beads, medals, cards, as well as The Catholic Leader. Gifts for baptism, confirmation and first communion are also available and special orders are most welcome. Goods are sourced through Christian Supplies and a catalogue is available to view. Run by volunteers of our St Vincent de Paul Conference, proceeds go to support their work with families in need in our local area. New volunteers to assist with running of the Piety Stall are appreciated and are encouraged to contact the St Flannan's Vinnies Conference or the Parish Office.